RetailPlayer Solution is the newest generation platform for multi-channel background music streaming. 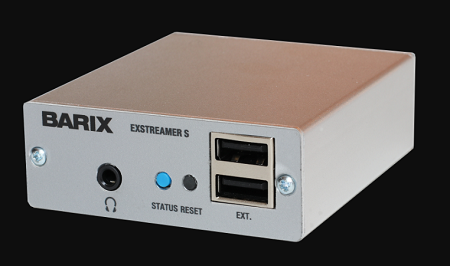 The brand new Exstreamer S hardware with RetailPlayer firmware defines a new price point for a background music delivery system to many sites. Targeting customer with a need for streaming background music and messages using the internet, the RetailPlayer solution provides a cost effective, robust and highly scalable solution. A portal server (that runs in the cloud or can be installed at the clients premises) provides the configuration as well as firmware update and management for all players. For the streaming server, the customer is open to select the most competitive solution on the market and is not locked to the Barix platform.